Dodge City will appreciate getting out in trip when he runs at Geelong on Thursday. 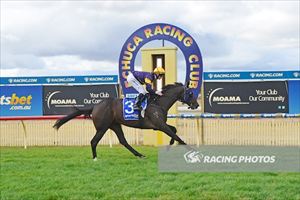 The son of High Chaparral runs in race five, the Benchmark Handicap over 2447m where he will be ridden by Patrick Moloney. Dodge City has the benefit of fitness now after four runs this campaign and Mike Moroney is expecting the extended trip to bring out the best in the four-year-old. “He will appreciate the step up in distance and from barrier two will be able to get a lovely run,” Moroney said. “His work has been very good leading into this race and he’s not too badly treated weight wise under the conditions of the race.